“Working for someone else, you lose your passion for the career,” says Brittany Alford, co-founder of The Hair Bar, located at Sola Salons Downtown Eugene. She and business partner Hollie Haaby were both feeling drained by the day-to-day humdrum; when they couldn’t find a studio that met their needs, they created one — and, the benefits associated with being the boss have far exceeded these stylists’ expectations. “I work for myself, I make my own hours, I set my own prices and I do what I want. That’s everyone’s dream,” says Hollie. It was a dream that had to be built from the ground up, though. “Brittany and I started our careers at High Maintenance Salon,” explains Hollie, who had been in school for architectural design when she woke up one July morning and realized she’d rather do hair. Hollie enrolled in beauty school a few months later, and by November of 2008 she’d wrapped up her degree in record time. Brittany, on the other hand, had known she was going to be a stylist since she was 15, when she started working as a receptionist at a local salon. “As soon as I graduated from high school I started beauty school,” she says. Post-school, Brittany leased space at the salon where she’d worked in high school, and it wasn’t a great experience. Between bookkeeping, product purchasing and client relations, Brittany felt overwhelmed. “It was a lot for somebody straight out of beauty school,” she admits. That changed when both stylists happened to accept hourly positions at Lussuria Salon and were reunited. Their friendship took off, but their careers did not! Hollie almost accepted a government job, right before she learned about Sola Salon Studios in Eugene, OR. Salon ownership sounded ideal — but, then again, Hollie had never owned her own business, and she had some reservations. Going into business with a partner, Hollie knew, would cut start-up costs in half. She approached Brittany with a pretty radical idea: Why not open our own salon? “I was not interested at all,” Brittany says. To appease her friend, though, Brittany agreed to a meeting with Amanda Schlumpberger, manager of Sola Salons Downtown Eugene. Amanda didn’t have to pressure Brittany with sales tactics: “She knew Sola was a good thing, and she didn’t need to sell it,” says Brittany. By the time that meeting was over, Brittany and Hollie were picking out paint colors for their new walls. “We had our whole studio up and running in seven days,” Brittany says. The stylists put in their 30-day notice at their previous gig, and even started working at The Hair Bar in the interim. “That’s when our friendship really blossomed,” explains Hollie. Both stylists were nervous about not having a guaranteed income. But, as Brittany points out, “Being an hourly employee was great because there was a steady paycheck, but you never made more than your paycheck.” At Sola, the sky’s been the limit. “My first month here, I literally tripled my income — and, that was just working three days a week,” Hollie confides. Brittany’s referrals doubled at Sola. “I think my clients were excited about how happy I was here, and they loved the atmosphere and environment,” she says. Both stylists have been pleasantly surprised by the amount of walk-ins they see, too. Three months into their new careers, and they were “totally booked out,” says Brittany. Sharing a salon – and designing one together – had been easy; the two stylists ended up having more in common than they’d imagined. And, joint ownership gave them the ability to work part-time, which was critical in the beginning because both women have children at home. 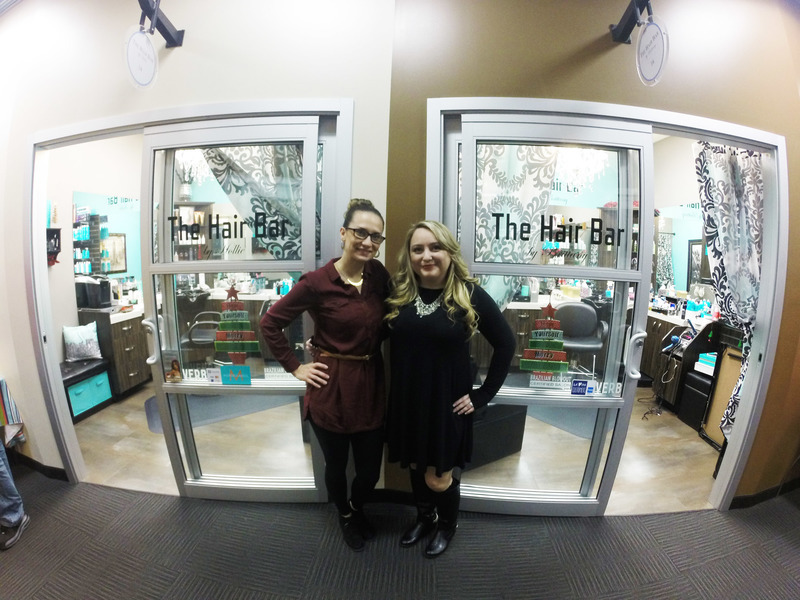 Hollie and Brittany moved into adjacent studios, and kept the ambiance they’d created together at The Hair Bar while expanding into their own brands: The Hair Bar by Hollie and The Hair Bar by Brittany. They’re growing alright — in more ways than one. “I got my passion back at Sola,” Brittany explains. And, that’s unlocked some pretty great opportunities for personal growth and success.